As I Struggle to know my own self, I am reminded to the heroes amongst us. These are the ones that do ordinary things that make a difference to others. Since my wife is a minister at a local church, I am often engaged in some work about the church. While I was cutting grass and doing yard work, one of the volunteers approached me. We noticed a dead skunk lying on the road in front of the house next to the church properly. “So that is why the scent of skunk had drifted into my bedroom window this morning,” I stated. “I guess we should dig a hole in the back yard and bury it,” I suggested. Right away he volunteered to do the dirty job. Later I relayed to him, “While others are driving over the skunk and complaining about the smell, a true servant of God buries the skunk.” He is one of my local heroes. Now, although I would never liken their job to that of burying a skunk, my attention turns to our wonderful Baha'i Local Spiritual Assembly. What an excellent job they are doing at directing the affairs of our community. They have to deal with all the problems of daily living like the rest of us, yet they take the time to meet and discuss the affairs of our city. Not only are they guidance to the Baha’is of London, they are also instrumental in shaping a future world society. Although its membership is made up of individuals not unlike ourselves, when they meet there is a kind of magic. I new entity comes into being which is completely subservient unto our Creator and enacts His will. Yet their role is to provide the framework and guidance to accomplish this work. It takes an arising of individuals to carry out their plans. From there the list of heroes blooms out and has many a flower laden branch. There is the branch of the Ruhi Class tutors. These self sacrificing individuals have busy lives and some can scarcely find time to look after their own personal needs, yet they book time off their important work, travel for miles and use their precious time to tutor a Ruhi class, often of less than five students. If only we could fill these classes with committed sincere students who desire to serve the Cause of God to the best of their abilities, we would have a more efficient use of their time. There are so many examples of heroes among our committees and co-ordinators who keep things running smoothly, who faithfully hold reflection meetings and study sessions which are often sparsely attended, but their faith and longing to serve the Cause of God is not diminished. If one person shows up at a meeting it is deemed a success, and the work of the Faith continues. These are my Heroes who are working toward the betterment of the human race. I cannot make mention of heroes without reference to our youth. How many meetings they have blessed us with their talents? How often they have inspired us to be better Baha’is? These young people, with all the temptations and peer pressure we faced when we were youth, are overcoming and gaining hero status at rates that are overwhelming and mind boggling. God’s will is being accomplished and He continues to raise up generations that exceed the expectations of the generations that went before it. Our heroes are all around us. It seems I cannot look to the left or the right without seeing at least one of them. And that is only the ones I know about. I’m sure that if I took the time to get to know you and find out what you have accomplished, you too would be my hero. Think Peace and we will have peace. We must not allow thoughts of hatred to enter our minds. War is proceeded by a thought of war. Thoughts of hatred lead to thoughts of war. A peaceful world begins with thoughts of peace, love and unity. 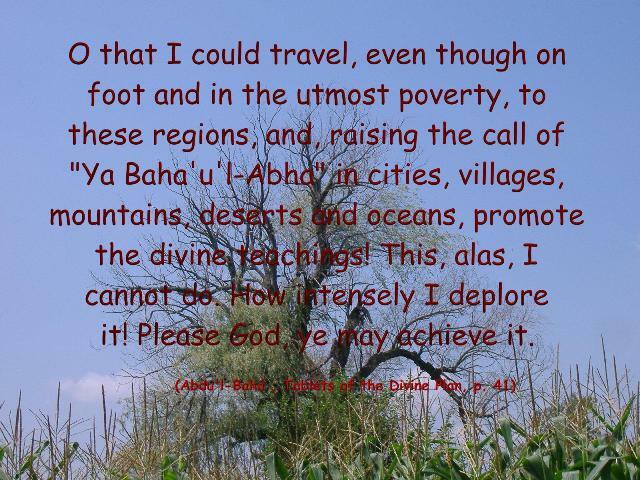 ‘Abdu’l-Bahá puts it this way. When soldiers of the world draw their swords to kill, soldiers of God clasp each other's hands! So may all the savagery of man disappear by the Mercy of God, working through the pure in heart and the sincere of soul. Do not think the peace of the world an ideal impossible to attain! 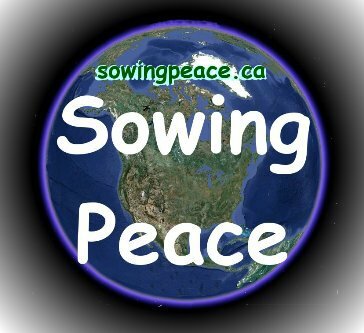 If I can sow a seed of peace in your heart, it may grow and its seed my spread to other hearts. This is my goal. I believe that world peace is best achieved by having peace in the hearts of all mankind. How can we every hope to stop world conflict if there is conflict within families and how can we prevent conflict within families if we are not at peace within ourselves? This is where I start; in my own soul. I must be at peace within myself. I cannot allow myself to commit any deed or entertain any thought that would cause conflict within my own being. From there I fit myself into my family setting and live at peace with my brothers and sisters, my parents and all my relatives. Now I expand to my community, to those I do business with and those I work with. All my actions, thoughts and speech must exude peace. As I travel I come in contact with more and more people. I deal with each one in an attitude of peace and in the process I may sow a seed of peace within them or cultivate the peace that is already growing there. As I do this, the peace within me grows and blossoms and produces fruit that I offer to others. If it is accepted and consumed, its seed will begin to grow until it blossoms and produces more fruit to be passed on. Soon peace will envelop the whole earth. We need to first desire peace, and then it will grow in us and spread to others. The process may be difficult at times. The weeds of envy, hate, greed and lust will have to be uprooted to make room for peace, and sometimes they are well rooted and difficult to dislodge. Yet, as we become the gardeners of our own souls it is up to us what we will allow to grow there. If we are diligent and seek divine guidance we will see this tree of peace grow within us. It will bear fruit and spread to others who, once they taste of its sweetness, will want it in the gardens their own souls. It is my desire that you will eat of this fruit and pass it on. It is so sweet and desirable to all. Just give it a try, if you don’t like it you can always go back to the old ways of hatred and war, but at least lets at least try it. Man is the supreme Talisman. Lack of a proper education hath, however, deprived him of that which he doth inherently possess. Through a word proceeding out of the mouth of God he was called into being; by one word more he was guided to recognize the Source of his education; by yet another word his station and destiny were safeguarded. The Great Being saith: Regard man as a mine rich in gems of inestimable value. Education can, alone, cause it to reveal its treasures, and enable mankind to benefit therefrom. If any man were to meditate on that which the Scriptures, sent down from the heaven of God's holy Will, have revealed, he would readily recognize that their purpose is that all men shall be regarded as one soul, so that the seal bearing the words "The Kingdom shall be God's" may be stamped on every heart, and the light of Divine bounty, of grace, and mercy may envelop all mankind.